Bruce Dooyema asked his parents for a dozen baby chickens as part of a school project when he was 13 years old. His parents instead bought two dozen. This school project led to a lifelong career and passion for global egg production. 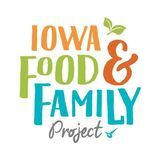 Center Fresh has operations in four Iowa counties, and thanks to Dooyema, in the African nations of Mozambique and Zimbabwe. This year, a farm will also be started in Zambia. Dooyema is passionate about providing exceptional care for the hens, being a good steward of the environment, contributing to his community and helping developing countries to learn how to raise affordable and nutritious food. He’s served on the American Egg Board for the past 18 years, and his sustainable approach recently led to appointments on the International Egg Foundation Board and World Poultry Foundation Board. “After successfully raising two dozen chickens, my parents put up a 60,000-bird hen house the summer before my freshman year of high school,” Dooyema shares. With Dooyema’s dad, Junior, in his mid-50s and putting in long, hard labor hours as a dairy farmer, his son’s interest in egg production provided an opportunity to re-focus the family farm. “We had 60 milk cows, a 50 farrow-to-finish hog operation and 100 steers – our operation was iconic of farms in the 1970s. We did a lit bit of everything,” Dooyema says. The consolidations came as egg consumption was growing. It didn’t happen overnight, however. In 1984, TIME magazine dealt a blow to the industry by dubbing eggs as a bad source of cholesterol. Today, the egg industry has come a long way from the famous cover story that made eggs the villain when it came to heart disease. It’s a fascinating reminder of the improvements in understanding human nutrition and heart health. Recent recommendations from the American Heart Association, American Diabetes Association and the 2015 Dietary Guidelines for Americans no longer limit cholesterol intake and include eggs as part of healthy eating patterns. Eggs provide high-quality protein and unique nutrients such as choline and lutein, making them a perfect complement to any diet. At an average cost of 17 cents per serving, eggs are an affordable source of highquality protein. For Dooyema and other egg producers, hen health is unequivocally their top priority. Inside the barns, technology maximizes environmental controls. 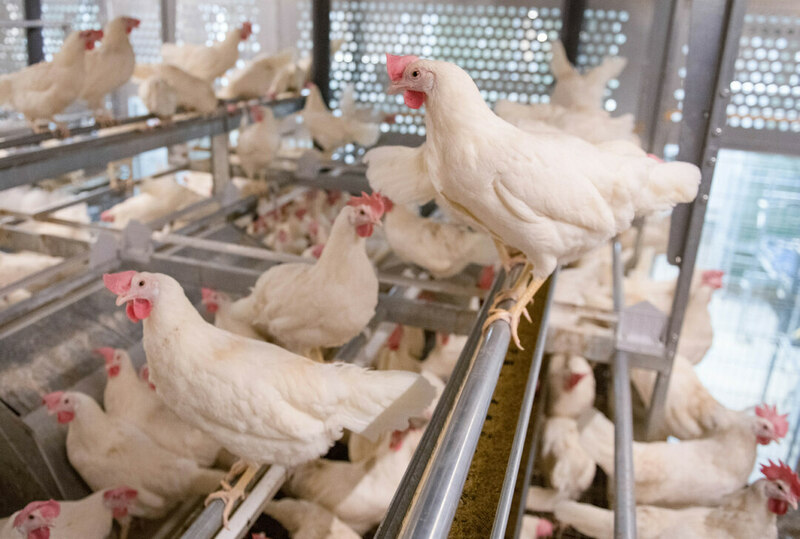 Center Fresh strives to have the perfect temperature according to the age of the bird; proper light; quality water, feed and ventilation; and sanitary conditions. For example, a day-old pullet needs air temperature around 92 degrees F, while a young bird thrives at 70 degrees F. As hens age, optimal temperature is around 80-82 degrees F.
Dooyema says every Tuesday managers discuss what’s happening with each flock. The team analyzes weather conditions – adjusting for warmer or cooler temperatures – and the age of flock to determine the rations. The age of bird and the diet affect the size of the egg. Most people want to buy large eggs at the grocery store, so the key is to manage the diet so the eggs are the right size. “It’s how we make our living – and we want a healthy food supply, so we are doing everything possible to keep our birds happy,” Dooyema explains. “When birds are happy, they lay more eggs. A visit to Mozambique in 2006 inspired Dooyema and his brothers Kim and Eric to bring modern egg farming practices to the African country. They helped build a modern, fully integrated egg facility in Mozambique that allows local egg farmers to produce nutritious and safe eggs to help feed the county’s growing population. 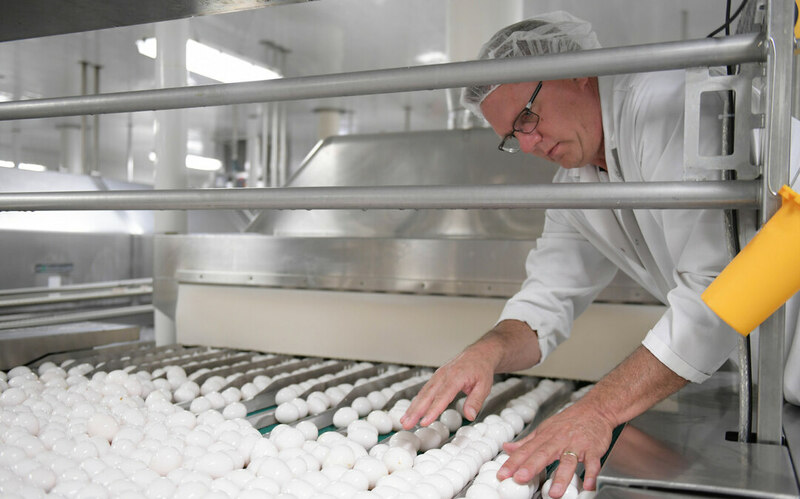 Before building the facility, there was minimal commercial egg production in the region. With each Mozambique resident only consuming 10 eggs per year, there is a great need for this highquality protein source. “Mozambique is one of the 10 fastest growing economies in the world. However, the area has 70-90 percent unemployment, and small farmers don’t receive the education and skills to learn sustainable practices,” Dooyema says. When Center Fresh starts a new farm, they also launch a technical training school called Ebenezer. Students live on campus for two years and are trained on how to grow produce, crops, broilers and manage layer houses. “This ensures they will have the skills to go into their own communities and start whatever type of agriculture that interests them,” Dooyema explains. Beyond teaching, Center Fresh’s priority has been to reduce disease pressure. 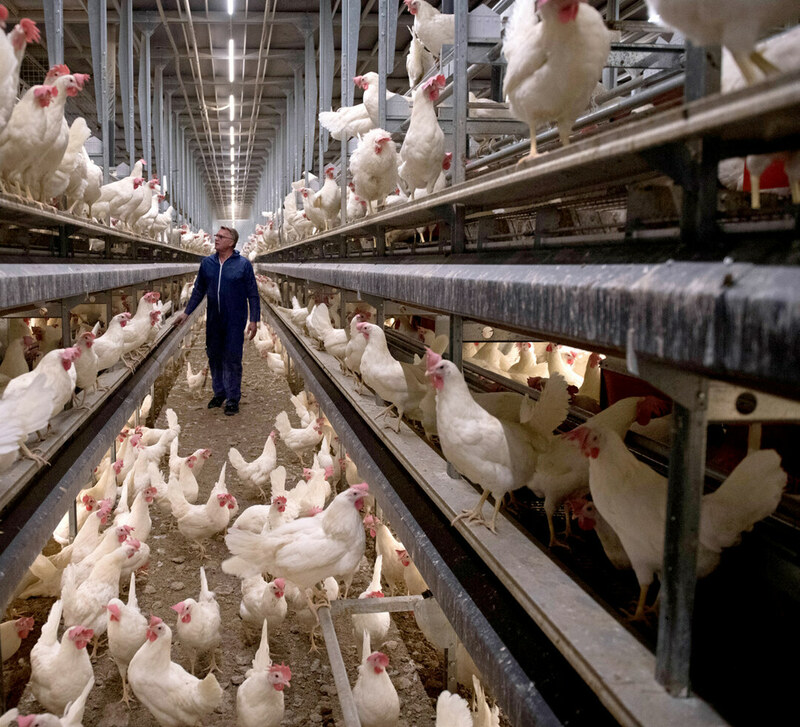 Because hens were in uncontrolled environments, disease spread rapidly on the ground, often wiping out 50 percent of flocks. Dooyema built a simple cage system — which has received enormous praise from the president of Mozambique — that has led to happier and healthier hens. A similar project was developed in Zimbabwe and another is planned for Zambia.